Astro City v02 - Confession (2015) Collects ASTRO CITY #1/2, 4-9. Astro City v03 - Family Album (2015) Collects ASTRO CITY #1-3 and 10-13. Collect Astro City: The Dark Age (2005-2009) BOOK 1-4 #1-4. 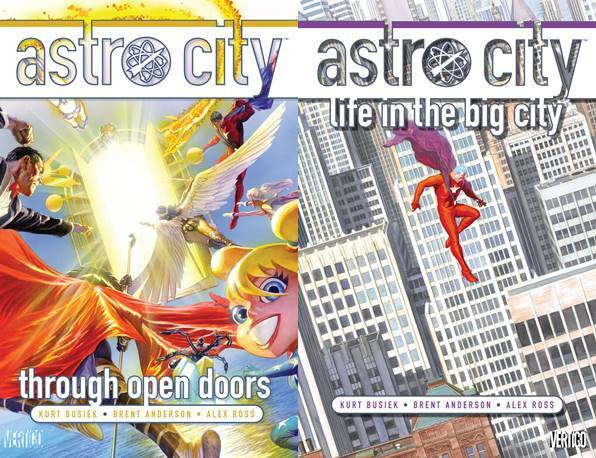 Astro City v08 - Shining Stars (2011) Collects ASTRO CITY: SAMARITAN #1, ASTRO CITY: ASTRA #1-2, ASTRO CITY: SILVER AGENT #1-2 and ASTRO CITY: BEAUTIE #1. Astro City v10 - Victory (2014) Collects ASTRO CITY #7-10 and ASTRO CITY VISITOR'S GUIDE #1. Astro City v11 - Private Lives (2015) Collects ASTRO CITY #11-16. Astro City v12 - Lovers Quarrel (2015) Collects ASTRO CITY #18-21 and #23-24. Astro City v13 - Honor Guard (2016) Collects ASTRO CITY #13, #22, #25, #27-28, and #31. Astro City v14 - Reflections (2017) Collects ASTRO CITY #26, 29, 30, 32-24. Astro City v15 - Ordinary Heroes (2017) The 15th volume in the award-winning ASTRO CITY series. Collects #35, #36, #39, #40, #42 and #44.